Great news following the failure of the two Terriers at the railway last year leading to the cancellation of their 50th anniversary weekend. See > http://www.haylingbilly50.co.uk/node/467 for last years cancellation notice. 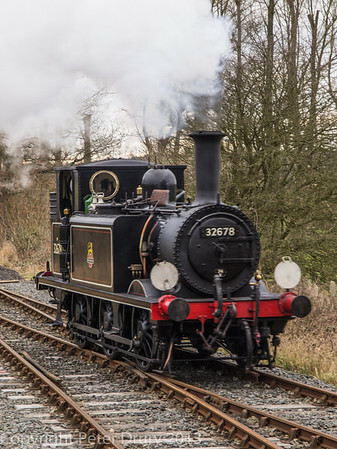 Terrier 32678 will be working a typical Hayling Island train over the weekends of 29th – 30th March and the 5th – 6th April. It may also run on April 21st. Details can be found on the Terrier Trust website. See > http://www.terriertrust.org.uk/atonement.html. I intend to visit the railway on the 29th March. If anyone in the Portsmouth, Havant or Hayling Island area would like to join me, please send me a PM. It’s a wonderful and friendly railway. It would be great to help them celebrate! See > http://haylingbillyheritage.org/uncategorised/kent-and-east-sussex-hayling-billy-service/ for my last visit in February 2013. Hugh Nightingale (Terrier Trust) has provided this interesting additional link > http://www.kesr.org.uk/news-2014/extra-steam-for-april to the Kent & East Sussex Railway website. I am very much looking forward to my visit tomorrow. I shall add a report and photos when I return. It’s great to see these circa 140 year old locomotives still performing the role for which they were designed. A great tribute to to the design and the people who maintain them.